Age-related macular degeneration (AMD) is the leading cause of irreversible blindness among the elderly in developed countries. Subthreshold retinal laser therapy is a new technique that targets drusen — a marker of nonexudative AMD — without causing incidental retinal damage associated with conventional laser photocoagulation. This review summarizes published literature on subthreshold retinal laser therapy as prophylactic treatment of nonexudative AMD. A literature search of the PubMed, Medline, and Embase databases was conducted from January 1997 to April 2018. 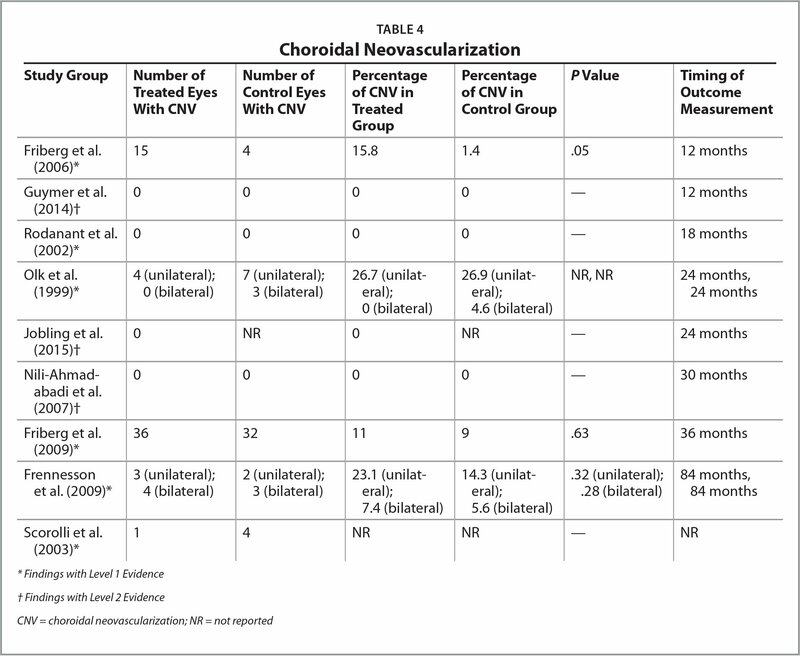 Studies were analyzed based upon study design, laser parameters, drusen reduction, changes in visual acuity (VA), and the development of choroidal neovascularization (CNV) and/or geographic atrophy (GA). 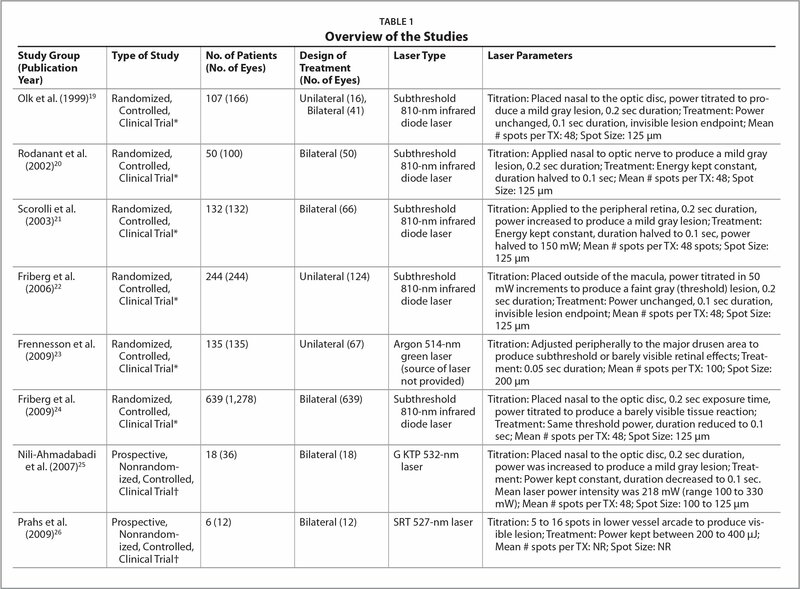 Twelve studies involving 2,481 eyes treated with subthreshold retinal laser therapy were included in this review. Treatment led to increased drusen reduction, and studies with significant VA improvement were associated with significant drusen reduction. There was no significant change in the risk of developing CNV or GA.
Subthreshold retinal laser therapy is effective for reducing drusen and potentially improving vision in patients with nonexudative AMD. This therapy does not show benefits in reducing development of CNV or GA. Thus, its long-term efficacy to prevent progression to advanced AMD cannot yet be recommended. Appearance of macular drusen during nonexudative AMD represents a risk of progression to advanced AMD. Given this intimate association, attempts to target this major risk factor with retinal laser treatment can be found as early as the 1970s.5–7 These clinical trials demonstrated that laser photocoagulation leads to significant reduction of drusen, but also a slight increase in the incidence of CNV and GA.8 Subthreshold laser therapy has emerged as an alternative laser delivery system designed to minimize these complications seen with conventional laser photocoagulation. 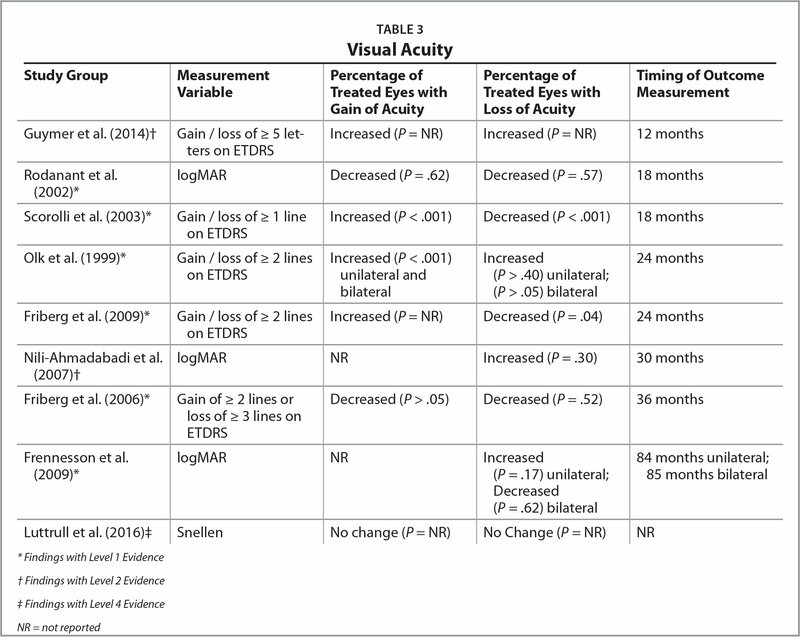 In preliminary clinical studies, subthreshold retinal laser therapy has shown efficacy in the treatment of central serous chorioretinopathy,11 diabetic macular edema,12–16 macular edema secondary to retinal vein occlusion,17 and macular telangiectasia.10 This review summarizes trends in clinical outcomes and treatment methodologies among peer-reviewed publications that evaluated subthreshold retinal laser therapy as prophylactic treatment of nonexudative AMD. This systematic review was conducted according to PRISMA guidelines.18 The PubMed, Medline, and Embase databases were searched for all English language articles containing varying combinations of the terms “subthreshold,” “non-damaging,” “laser,” “macular degeneration,” “age-related macular degeneration,” and “age-related maculopathy.” Relevant articles were also selected from the references of identified articles. As of April 2018, a broad search resulted in 1,373 peer-reviewed publications from January 1997 to April 2018, among which 12 relevant articles were eligible for systematic review.19–30 Only manuscripts that described the attempted use of subthreshold retinal laser therapy to prevent the progression of nonexudative AMD were included. All other manuscripts were excluded. Articles were analyzed qualitatively based upon study design, treatment parameters, adverse outcomes, and therapeutic effectiveness as measured by drusen reduction, changes in visual acuity (VA), and development of CNV or GA.
Two independent authors selected the articles and graded the strength of the clinical data based on the Oxford Centre for Evidence-Based Medicine's “Levels of Evidence 2 Table”.31 The authors resolved any discrepancies in a joint discussion. 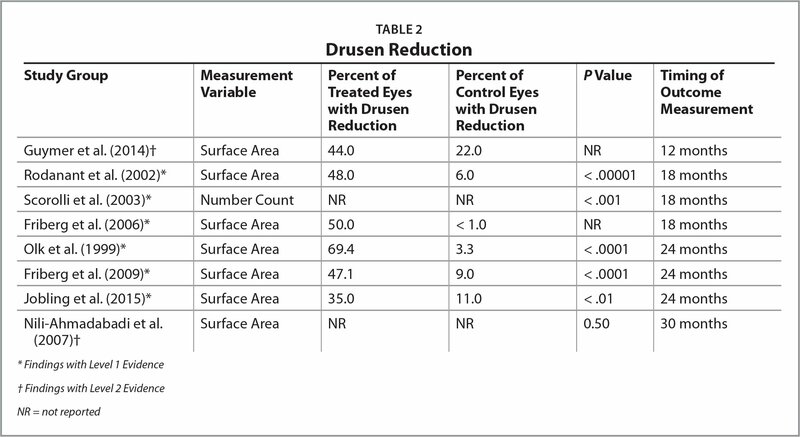 Drusen reduction was evaluated based on the investigators' definition. Change in VA was determined by a gain or loss of letters / lines as determined by ETDRS or Snellen, or by numerical report of logMAR. Development of CNV and GA was evaluated based on their respective incidence during the follow-up period. Study level bias was assessed using the latest version of the Cochrane Risk of Bias 2.0 and ROBINS-I tools. All data were extracted by the authors and recorded on an electronic data collection sheet. The inclusion criteria of the studies varied. All of the prospective studies recruited patients aged 50 years or older except the study by Scorolli et al., which recruited patients 55 years or older.21 The majority of prospective studies included patients with at least five or 10 medium (> 63 μm) or large (> 125 μm) drusen in the study eye if unilateral in design or both eyes if bilateral in design. The minimum VA ranged from 20/25,21,23 20/60,25,27 or 20/6319,20,22,24,28 to 20/100.21 Other inclusion criteria characterizing the majority of prospective unilateral study groups included neovascular lesion in the non-study eye (CNV, pigment epithelial detachment [PED], tear of the RPE, or fibrovascular scar). In a recently published Cochrane review,8 four subthreshold laser studies were compared to assess prevention of progression toward advanced AMD. The Cochrane review concluded that photocoagulation targeting drusen was effective for reducing the amount of drusen but does not provide benefits for vision nor prevent CNV or GA development.8 However, the authors acknowledged that their evaluation was limited due to the low number of subthreshold studies reviewed. In this review, an additional eight studies using subthreshold laser are included, with the most recent study (Luttrull et al.) having been published in 2016.20,21,25–30 This review differs from the Cochrane review by assessing subthreshold studies independent of conventional laser studies. Furthermore, given the variability in the treatment methods among the 12 studies, this review is also the first to evaluate trends in subthreshold laser treatment application that suggests its safety and efficacy. Although few studies have treated AMD patients with subthreshold laser, the 12 studies identified in this review confirm the short-term efficacy of subthreshold laser therapy in reducing drusen among nonexudative AMD patients. All short-term studies with follow-up periods up to 24 months demonstrated statistically significant treatment of drusen.19,21,22,24,25,27,28 Subthreshold retinal laser therapy can therefore be considered effective for reducing drusen for the first 2 years after treatment. Extending beyond 24 months, Nili-Ahmadabadi et al. did not find a significant difference in drusen burden after 30 months when using the G KTP 532-nm laser.25 However, the authors did note a general decreasing trend of drusen incidence over time among laser-treated eyes as compared with an increasing incidence trend among untreated control eyes.25 The long-term effect of subthreshold treatment on drusen reduction remains inconclusive due to the scarcity of studies that track drusen load beyond 2 years. In terms of clinically meaningful endpoints (visual acuity, CNV, GA), most studies failed to find a significant difference in VA between treated and control groups.22,23,25,27,30 However, there appears to be a relationship between drusen reduction and VA benefits in the three studies that reported significance.19,21,24 Between these three, Scorolli et al. reported decreased loss of acuity in treated eyes, Friberg et al. reported increase in best-corrected VA in treated eyes, and Olk et al. reported both a decreased loss of acuity and increased gain of acuity in treated eyes.19,21,24 These three studies also represent three of five total studies that found significant drusen reduction after subthreshold treatment. The remaining two studies that reported significant drusen reduction either did not monitor VA during follow-up or did not find significant changes in VA.20,28 It is possible that significant visual benefits occur only if substantial drusen is cleared by laser treatment. The delay of central GA onset by subthreshold laser therapy cannot yet be determined from the three studies that tracked GA. The treated groups of two studies demonstrated reduced occurrences of GA, but the significance of the results is unknown.21,27 Prahs et al. applied subthreshold laser in six eyes with GA from AMD, and laser treatment showed an insignificantly higher rate of GA progression in treated eyes when compared with untreated fellow eyes.26 More data are required to make a conclusion on the efficacy of subthreshold laser in preventing central GA.
Aside from the incidence of CNV, there were no reports of subthreshold laser causing adverse events such as constricted visual field, decreased night vision, choroidal detachment, corneal or lens opacification, or macular edema.32,33 Of the 2,481 treated eyes, only one patient experienced an adverse ocular event: Guymer et al. reported a patient who developed a dot hemorrhage during the titration phase when 0.45 mJ was applied.27 The maximal laser energy was then limited to 0.3 mJ for the remaining patients with no further reports of adverse events. Funduscopy was also performed in most studies after laser treatment to verify the absence of laser spots. However, Mojana et al. found via spectral-domain optical coherence tomography / scanning laser ophthalmoscopy (SD-OCT/SLO) that permanent photoreceptor loss had occurred in 29% of treated eyes.29 Their observation of photoreceptor damage after treatment serves as a caution for future clinical trials, which should seek to achieve truly subthreshold therapy as determined by adaptive optics. The results of these 10 studies emphasize the importance of accurately and objectively establishing threshold to prevent damage to the retina. To address this concern, the EndPoint Management (EpM) protocol was developed as a computational model-based titration algorithm that reliably optimizes laser parameters to yield reproducible therapeutic response. As performed by the physicians in the studies reviewed herein, titration to a visible retinal lesion is subjective. Instead, the EpM protocol uses a binary criterion to determine if the initial titration lesion is visible or not, and then adjusts both power and pulse duration to elicit a desired change in retinal morphology ranging from non-damaging to intense coagulative tissue effects. A study of subthreshold laser therapy titrated using the EpM protocol showed no cone cell or RPE damage via SD-OCT / SLO imaging at all time points during a 9-month period.41 Wherein the greatest challenge of subthreshold retinal laser therapy is setting the laser parameters high enough to prevent subtherapeutic treatment yet low enough to avoid damage to the RPE or neurosensory retina, the EpM algorithm may help to define the therapeutic window and standardize this form of therapy. A clinical trial (NCT02569892) utilizing the EpM protocol is currently underway at the Byers Eye Institute at Stanford University and other worldwide sites, and will provide greater clarity into the clinical benefits of drusen reduction in preventing the progression toward advanced AMD. The studies presented in this review provide evidence that subthreshold laser therapy is effective in lowering drusen load for patients with nonexudative AMD and may improve visual acuity in patients who achieve significant drusen reduction. Standardized laser protocols that ensure subthreshold treatment and eliminate the confounding effect of retinal damage will aid in better understanding the efficacy of drusen reduction on the incidence of CNV or GA.
Hageman GS, Gehrs K, Johnson LV, Anderson D. Age-Related Macular Degeneration (AMD). In: Kolb H, Fernandez E, Nelson R, eds. Webvision: The Organization of the Retina and Visual System. 2008:1–54. Gass JD. Photocoagulation of macular lesions. Trans Am Acad Ophthalmol Otolaryngol. 1971;75(3):580–608. Cleasby GW, Nakanishi AS, Norris JL. Prophylactic photocoagulation of the fellow eye in exudative senile maculopathy. A preliminary report. Mod Probl Ophthalmol. 1979;20:141–147. Virgili G, Michelessi M, Parodi MB, Bacherini D, Evans JR. Laser treatment of drusen to prevent progression to advanced age-related macular degeneration. Cochrane Database Syst Rev. October2015;(10):CD006537. Nili-Ahmadabadi M, Espandar L, Mansoori MR, Karkhane R, Riazi M, Ardestani E. Therapeutic effect of macular grid photocoagulation in treatment of nonexudative age-related macular degeneration. Arch Iran Med. 2007;10(1):14–19. OCEBM Levels of Evidence Working Group. The Oxford Levels of Evidence 2. Oxford Centre for Evidence-Based Medicine. http://www.cebm.net/index.aspx?o=5653. Accessed December 12, 2017. From Byers Eye Institute at Stanford, Stanford University School of Medicine, Palo Alto, California (VAE, TL); Associated Retinal Consultants, P.C., Royal Oak, Michigan (EHW); the Department of Ophthalmology, New York University School of Medicine, New York, New York (SB); and Oregon Eye Consultants, Eugene, Oregon (PAK). Dr. Leng reports personal fees from Carl Zeiss Meditec and 23andMe, and grants from Genentech, Allergan, and Ohr outside the submitted work. The remaining authors report no relevant financial disclosures. Dr. Leng did not participate in the editorial review of this manuscript. Address correspondence to Theodore Leng, MD, MS, Byers Eye Institute at Stanford, Stanford University School of Medicine, 2452 Watson Court, Palo Alto, CA 94303; email: tedleng@stanford.edu.